Although Good Friday is a public holiday back home, it's business as usual aboard the RRS James Cook. Our survey using TOBI continues, mapping the geology of the volcanic ridge beneath us. But the images from TOBI so far have given us plenty to chew over in our daily science meeting, as we decide where to launch Autosub6000 to hunt for deep-sea vents. Discovering deep-sea vents is the main goal of our expedition. We now know that vents occur in a wider range of geological settings than scientists thought when the first vents were seen three decades ago. 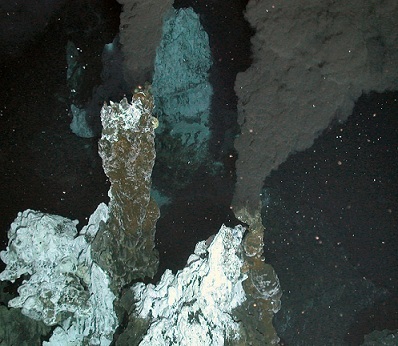 We also know that the chemical composition of the fluids erupting the deep-sea vents also varies with geological setting. In today's diary, our expedition Principal Scientist and geochemist Doug sheds some light on the chemistry of these natural wonders of the seafloor. Doug, you've been 'hunting' vents for several of years - how do you find them? We use the geology to show us where vents may be and then test the water to confirm evidence of venting. Our first approach will generally be to look at the centre of a ridge, even better if the ridge has an axial valley. The valley will 'trap' water and minerals and we can place sensors into the valley to look for evidence of unusual chemical or physical properties for example, particle clouds in the water. We collect water from those particle rich areas and analyse for chemical signatures such as iron, methane and manganese. Doug, which chemicals are you looking for? Generally we are looking for iron, methane, and manganese, but helium-3 is the signature that gives us a definitive answer. All vents give off helium-3, but it is very hard to detect. Dissolved iron in the vent fluid mixes with sea water and forms rust which floats around with the currents and ultimately settles on the sea bed. We can pick this up on the LSS (Light Scattering Sensor), which measures the abundance of floating particles. But the problem with iron is that it does not hang around for long - two hours at most, meaning you have to be near a vent site to sense it, otherwise it floats away with the current. It looks like smoke. Dissolved manganese, however, hangs around for up to 45 days. This means that looking at the ratio of the dissolved iron to manganese in our water samples can give an idea of how long the vent fluids have been in the water and therefore how far from the vent we are. The presence of methane (natural gas) can also give us clues about which types of rocks host the system. Once we complete the TOBI survey tomorrow, the next step will be to survey the deep waters of the volcanic ridge to look for these chemical signatures of nearby venting, before we send down our other undersea vehicles for a closer look.